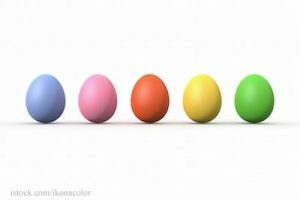 Coloring eggs and eating them is an Easter tradition for many families. But because eggs are a common source of Salmonella, it’s important to prepare, store and handle them safely. Every year, about 79,000 people are sickened by Salmonella from eggs and 30 people die, according to the FDA. Symptoms of a Salmonella infection, which include diarrhea that can be bloody, fever, abdominal cramps, and vomiting, usually develop between six and 72 hours of exposure and last about a week. For some people, the diarrhea may be so severe that hospitalization is required. These patients are at risk for more severe illness caused when the infection spreads from the intestines to the bloodstream. Those most at risk include children, seniors, pregnant women, and those with weakened immune systems such as transplant patients, and people with HIV/AIDS, cancer, and diabetes. The U.S. Food and Drug Administration (FDA) has compiled the following tips to help everyone stay healthy. Buy only eggs sold from a refrigerator or refrigerated case, check that shells are not cracked before purchasing. At home, store eggs in their original carton in a clean refrigerator at a temperature of 40° F or below. Use a refrigerator thermometer to check. Use them within three weeks of purchase for best quality. Eggs can be frozen, but not in their shells. To freeze them, beat yolks and whites together or freeze egg whites by themselves in a plastic, freezer-safe bag. Use frozen eggs within 1 year. Hard-cooked eggs should be kept refrigerated and eaten within a week after cooking. Never leave cooked eggs or egg dishes that have been out of the refrigerator for more than two hours or for more than 1 hour when temperatures are above 90° F. Bacteria can grow quickly at these temperatures. For school or work lunches pack them with a small frozen gel pack or a frozen juice box. Fried eggs should be cooked until yolk and the white are firm. Scrambled eggs should not be runny. Casseroles and other dishes containing eggs should be cooked until a food thermometer indicates they have reached a temperature of 160° F. Leftover cooked egg dishes should be refrigerated and used within four days. Pasteurized eggs should be used for recipes that call for raw eggs such as Caesar salad dressing and homemade ice cream.